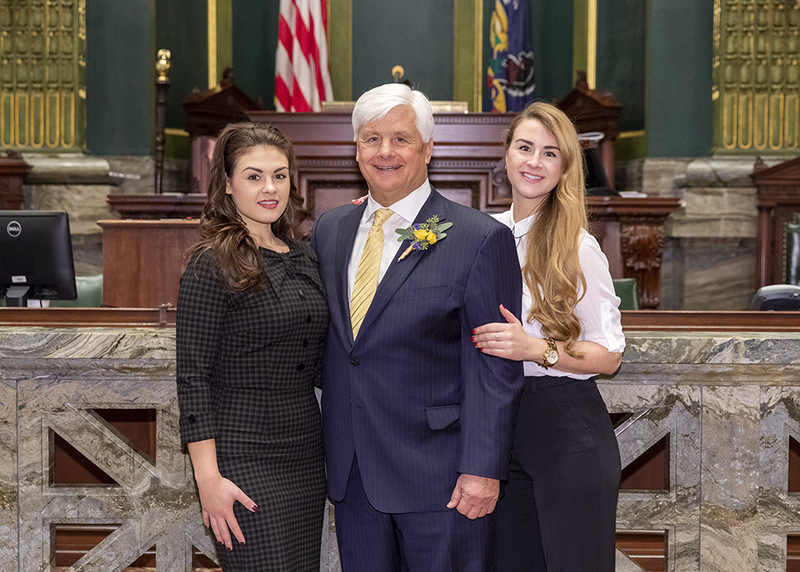 Senator Tomlinson and his daughters KC & Maddie Tomlinson during swearing in ceremonies at the State Capitol in January. A Veterans Service Officer can check to see if changes in a veteran’s circumstances or changes to benefit policies may have modified the programs a veteran may be eligible to receive. Find out how to safeguard paperwork and review benefits here. Winter is the best time to test your home for radon, an odorless, naturally occurring, radioactive gas that’s the second-leading cause of lung cancer. About 40 percent of Pennsylvania homes have radon levels above the EPA’s action guideline of 4 picocuries per liter. Testing is the only way to know if your home has elevated levels of radon, and it’s easy. You can find out how here. Addiction to drugs and alcohol is a growing problem with terrible – and sometimes deadly – consequences. The state Department of Human Services offers an online questionnaire and a special hotline to help connect Pennsylvanians with the drug and alcohol support services they need. The online questionnaire offers additional information on the types of services that are available. The questionnaire is available here. State residents can also call 1-800-662-4357 to learn more about drug and alcohol treatment services that are available in local communities. The Federal Trade Commission (FTC) is urging consumers to be aware of new scams involving callers pretending to be from the Social Security Administration (SSA) in an effort to gain access to an individual’s personal and banking information. The scam involves a caller telling a consumer that their Social Security number has been linked to identity theft or another crime. The caller then asks the consumer for their Social Security number and other personal information that could be used for the purposes of identity theft. The SSA will never call to ask for an individual’s Social Security number. More information about this scam – and how to avoid it – is available here. Pennsylvania anglers can purchase their 2019 fishing license now at any of the state’s 700 issuing agents, county treasurer’s offices, Pennsylvania Fish and Boat Commission regional offices, or online at www.gonefishingpa.com. Licenses purchased now at a cost of $22.90 will be valid through December 31, 2019. More information for anglers is available online at http://www.fishinpa.com/. When you are watching the snow fall and wondering, “Where’s My Plow”, the answer is a click away at 511PA.com. The Automated Vehicle Location equipment reveals the plow’s location and whether or how much product is being spread. Brine, salt, and anti-skid are used singly or in some combination depending on the temperature, precipitation type, and traffic volume. The Pennsylvania Department of Transportation winter operations use more than 2,248 trucks, plows, and salt spreaders across nearly 95,000 snow-lane miles. Another 380 trucks are added to the crews as necessary to assist PennDOT in executing winter storm tactics. The Winter Services Guide offers specifics on your county’s snow removal operations.